While most travellers to visit the Yukon with hopes of seeing the iconic large wildlife of the region like moose and bears, McGill researcher Chris Buddle went there last month with a small team of researchers to seek out much smaller life forms – the insects and spiders in Canada’s North. 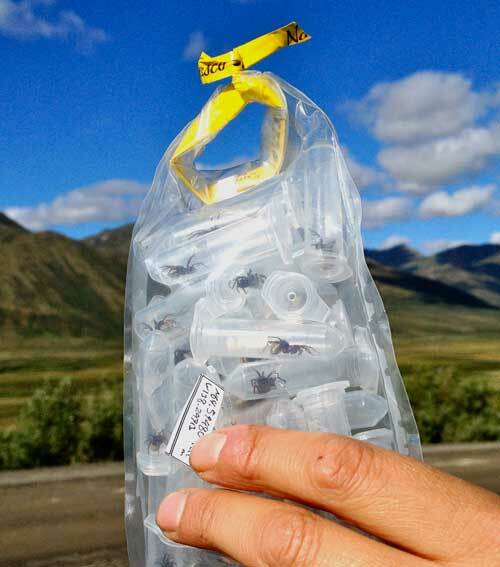 A “bag of spiders” collected on the Tundra. Our entomology research team has just arrived in Whitehorse in anticipation of our upcoming fieldwork in the Yukon. I just returned to my room after enjoying a beer at the hotel bar where we completed our GIANT shopping list this evening. Tomorrow morning we are picking up our RV, and will be driving about 500 km NW of Whitehorse (on paved roads) before turning onto the Dempster Highway. This famous Yukon road is a dusty, gravel road that heads straight up towards the Northwest Territory, crossing the Arctic Circle, and takes you from Boreal spruce forests in the south to sub-arctic tundra in the North. The Dempster crosses the Yukon-Northwest Territory border at about kilometer 465, and then continues on to Inuvik. It’s a big trip with few opportunities for groceries along the way. We are all part of the Northern Biodiversity Program – a multi-University collaborative project about the diversity of insects and spiders in Canada’s North. After months of planning, applying for research permits, and fine-tuning our methods, it is great to finally be here. That being said, I worry that the excitement and anticipation will keep us too jittery to get a good night’s sleep tonight – too bad since after tonight, we’ll be sleeping in tents rather than hotel rooms. We have made it up to the Tombstone mountain range, about 75 km up the Dempster Highway. Unfortunately, the weather has not been cooperative, so we are stuck in the campground, huddling in a cook-shack with other travelers. Most of the other campers are on vacation, so we are unusual since our trip is for research. We are also unusual because unlike most visitors to this part of the world, we are not viewing large wildlife (bears, moose) but are instead spending our time searching for the tiny wildlife along the Dempster. Our team includes two graduate students from my laboratory, Crystal Ernst and Katie Sim, who are co-supervised by Prof. Terry Wheeler, Dept. Natural Resource Sciences. Crystal has been setting out “pan traps” (yellow bowls) to collect ground-dwelling arthropods (i.e., insects, spiders). 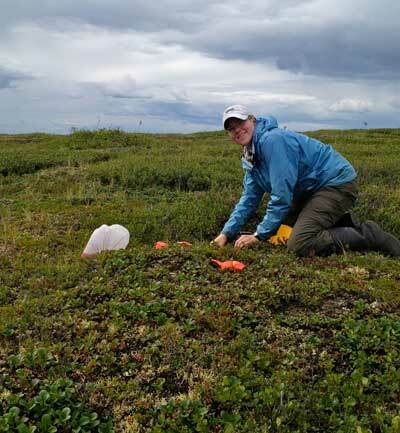 Part of her PhD is about unraveling some of the complexities of arthropod-based food webs in the Arctic, and she is using these traps to collect critters that live on the tundra. Thankfully, her work does not require good weather. Katie is working on the population genetics of a high arctic wolf spider, Pardosa glacialis – and she needs some more specimens. We know that the species occurs near the Yukon-NWT border (in the Richardson mountains), about 300 km north of us. A post-doc, Dr. Laura Timms, is also part of our team – she studies plant-insect interactions in the North, and is focusing her research on insects that feed on Willow and Balsam Poplar trees. Our final team member is Dr. Barb Sharanowski, an entomology professor from the University of Manitoba – she is collecting parasitic wasps, with a goal of better understanding their evolution and diversity in northern environments. Unfortunately, Barb and Laura’s work is dependent on dry and warm weather, so they are hoping for good conditions. I am here to find a small (< 4 mm) and curious Arachnid known as the Arctic pseudoscorpion. Pseudoscorpions are relatives of other Arachnids, and resemble scorpions, but without a tail. 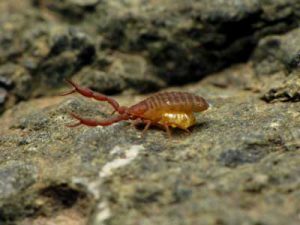 They are predators (of other invertebrates) that live in soil, leaf-litter, under bark, and under rocks. The species Wyochernes asiaticus lives under rocks beside creeks and rivers in the Yukon. It is a Beringian species, meaning it exists in North America in regions that were unglaciated during the last ice age, including many regions in the Yukon. The Dempster Highway travels directly through a lot of these regions. I have previously collected this species in the Yukon, and on this trip, I am hoping to gather more specimens to further understand its full distribution, and to collect data about its biology and life history. This morning, despite the rain, our team traveled to a half-dozen streams further south from this campground, and we had great success in pseudoscorpion hunting. Numerous specimens were found under rocks beside creeks, including females with their eggs held under their abdomen. We are now drying out and I am about to finish preparing a seminar that our team will deliver tomorrow at the campsite. The Tombstone Park staff are keen to have researchers discuss their work with the general public – it’s a nice opportunity to share our research stories with other people traveling the Dempster. I am always thrilled that all types of audiences show keen interest and enthusiasm about insects and spiders. We have had a busy few days – we finally got some drier weather in Tombstone and Laura and Barb were able to do some collecting, and Crystal set some more traps. We left Tombstone a couple of days ago to drive north, collecting en route. We have seen some of the larger wildlife, including arctic fox, moose, and grizzly bears. However, our sights were really set on the smaller wildlife. Barb was particularly impressed with the diversity of parasitic wasps at a place called Windy Pass – an area known for hosting a lot of rare, Beringian species. Entomologists have collected at this locality for decades. We crossed the Arctic Circle yesterday, and the Rock River campground is nestled in a river valley just north of the Arctic Circle. We are now officially in the Richardson Mountain range – the tundra habitats about 10 km north of this campground is one of the most beautiful places on the planet. I feel very lucky and privileged to be here. Although we had some more rain and cold weather yesterday, today was a perfect summer day at this latitude (i.e., it got just above 20C) – it was also a very windy day, which was bliss since higher winds mean that the incessant hordes of mosquitoes are kept at bay. Fieldwork in the sub-arctic is quite challenging, in part because of the relentless mosquitoes. We collected well into the NWT, getting all the way to the Peel River (located about 540 km up the Dempster). Crystal found the most northern locality for Wyochernes asiaticus in the NWT and for that reason I will buy her a beer whenever we get back to civilization. Unfortunately we have yet to find Katie’s wolf spider species – we have checked a few locations but have come up empty – there are certainly many other species of wolf spiders on the Tundra, but the ones we have collected have not been Pardosa glacialis. Our team is a little anxious about this, as we only have a few more days at the Richardson Mountains before heading south. We are now back in camp and it should be time to crawl into the tents. At this latitude it is pretty difficult to think about going to sleep – it is light 24 hours a day, so it is hard to trick the body into thinking it is time for sleep. It’s even harder to get to sleep knowing that Pardosa glacialis is out there… somewhere. I am back in the world of electricity, Internet, hotels and tourists. The layers of mosquito repellent have finally been washed off after a much-needed shower in the hotel last night. The big news is that the day after I last wrote, we managed to find and collect Pardosa glacialis! We woke early on July 15 and went up to the high elevation tundra habitats located exactly on the border of the Yukon and NWT (we are not even sure what Territory to write on our collection labels – the site was, literally, on the border). All five of us helped Katie look for wolf spiders, and after a couple of hours of searching and collected, we found dozens of specimens – this was thrilling, as these specimens are very important for Katie’s research and we were getting anxious about not finding any. We also got a little bit lucky – within an hour of that sampling, some rather nasty weather blew in and we were forced back to camp for the afternoon. In the rain, tundra wolf spiders tend to hunker down deep into the moss and lichens, not to be seen. I have mixed feelings about being able to catch up on e-mails, and I certainly miss my family. However, I am also missing the fields of cottongrass on the Arctic tundra, eating cloudberries in high mountain passes, and seeking new localities for the Arctic pseudoscorpion. The Dempster Highway is a biologist’s dream – full of wildlife, stunning vistas, amazing habitats, a unique biogeographical history and a region that hosts a rather stunning and diverse arthropod fauna.